I read the premise and immediately requested this one on Netgalley as it sounds so cool and topical. We follow these five people as they take the test and have to cope with the consequences as they find themselves dealing with the fallout. I am not going to be able to go into details because I’m allergic to spoilers and Marrs’ clever plotting is one of the best things about this smart near-future science fiction adventure. I have to say I nearly skipped this one in the early stages with the intention of returning when I wasn’t feeling so thick-headed and ill as reading a short passage in one viewpoint before being yanked away into yet another pov isn’t my favourite narrative mode. Fortunately, trying to work out what to read next proved just as taxing so I decided to go with my default which was to give it until 20% to get going. And by the time we got to that stage, I was hooked. The cast of characters were all engrossing and well depicted. As for likeable – well, they mostly were with one outstanding exception and if I’d realised he was part of the story there is a strong likelihood I would have given this one a miss. However, I am glad I didn’t as I would have missed the sheer bravura of Marrs twisty plotting where little is as it seems. In amongst this unfolding story, Marrs raises some interesting and disturbing questions… While couples in established and loving relationships are encouraged to take the test as they find it deepens their love for each other when they discover they are Matched – what happens if they aren’t? And while the genetic test can find a Match for the majority of the population, there are instances where they can’t. Either their genetic match has died, or isn’t on a database – what happens then? And has this engrossing tale demonstrates – being Matched doesn’t guarantee living happily ever after as there all sorts of intriguing scenarios where it is little short of a disaster. In fact, I came away from this interesting, thought provoking book with deep thankfulness that I have a kind, loving companion who deeply cares for me – and a fervent promise to myself that whatever happens I’d never dabble in getting Matched, should the opportunity come up. This one is highly recommended. 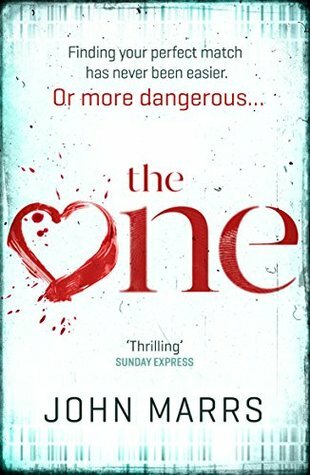 While I obtained the arc of The One from the publisher via NetGalley, this has in no way influenced my unbiased review. Fab review! I bought this book a while ago but haven’t got around to reading it as yet. It does sound like such a fascinating premise for a novel and I hope to read it soon. Thank you Hayley – yes, it is a really enjoyable read. I look forward to reading what you think about it. This certainly is fascinating concept, and I loved the review because of the description of the “process” you went through from hearing ABOUT the book, to getting started, to getting “hooked” etc. Great review (as usual). Thank you Rae – yes… it is a really engrossing read with the story steadily building up as you continue learning slices of each person’s life. I”m not sure I’d want to take that test! This does sound interesting and intriguing though. I like that the majority of the characters are likable. So often in anything science fiction-y they aren’t. I’ll have to look for this one. It sounds different and like it gets you thinking! This sounds excellent – I will definitely add this to the wishlist. Great review. Thank you! It is a really engrossing read. Oooh, what an interesting book! I’m definitely putting it on my TBR list. I love the premise, because it resonates with my thoughts about love and finding partners: that people are often desperate for quick solutions (love from the first sight, etc.) and they aren’t willing to work for the relationship, to figure out differences, etc. I’d love to see the author’s view on those things. It’s a really spiky, unexpected read with all sorts of scenarios that go awry. I loved it.